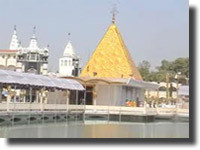 The Shiv Mandir is located at Gur Mandi in the city of Jalandhar which is a well known and venerated temple of the Hindus. The Temple was founded by the Nawab of Sultanpur Lodhi who built the temple near Masjid Imam Nasar. The Temple exhibits a blend of Muslim Hindu architecture. The main gate of the temple is built in the style of a mosque while the rest of the building exhibits the Hindu style. Shiv Mandir, Gur- Mandi, Jalandhar is one of the most ancient temples of the region, which represents the deep religious fervor of Punjab. The temple is located in the heart of a busy market of the "Gur- Mandi" , the main deity of the the temple is Lord Shiva which bears relics of the brilliant architectural ability of the ancient times. The temple is constructed by a Muslim "Nawab" of the "Lodhi dynasty"; adjacent to the mosque of Imam Nasar, the age old temple is a living witness of religious tolerance which has triggered down across the centuries to the modern period. The famous temple of Lord Shiva showcases the engineering skills of the people of the bygone days. The temple presents a perfect blend of the Hindu and Muslim architecture. While the entrance to the sacred temple was modeled after the gate of a mosque, the other buildings of the temple bears a rich style of the Hindu architecture. The myth of the Shiv Mandir states that when Nawabs used to rule Jalandhar, a Nawab had eyed a newly married Hindu girl who was a devotee of Lord Shiva. He wanted her as an object of his lust. But as she was a devotee of Lord Shiva, the serpent of Lord Shiva saved her honor. Then later the Nawab begged pardon from the girl and on her bidding built the temple. Dating back to the Lodhi Era, this temple is entirely dedicated to Lord Shiva.The Mandir dates back to the Lodhi Era. The temple has an unusual architecture. The Shiv Mandir is visited by many devotees through out the year. However, the holy shrine of the temple is assumed to be of special importance during "Shiv Ratri" and other Hindu festivals when devotees throng the place to seek divine prayers. The Shiv Mandir has become an important landmark of the ancient city of Jalandhar. Amidst all the problems of religious intolerance and injustice, the Shiv Mandir of the Gur Mandi stands tall with its long and enriched history of secularism. The Sarnath Temple is embedded with many Stupa worth visiting. Guru Hargobind visited the city of Jalandhar during his tour of Doaba area. Gurdwara Chhevin Padshahi in Basti Shaikh stands on the spot where Guruji granted interview to a Muslim holy saint popularly known as Shaikh Darvesh. 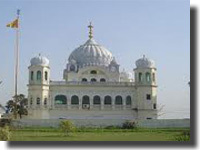 Kartarpur located 16 km from Jalandhar is a veru much popular Gurdwara built by the Fifth Sikh Guru, Guru Arjun Devji in 1656 A.D. A fair is held every year on his birth anniversary. 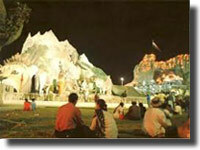 Large number of devotees attend the fair. There is a Smarak here for Swami Virjanad who was the teacher of Swami Dayanand Saraswathi, the founder of Arya Samaj. Kartarpur is also famous for its furniture industry. The mosque is located in Kapurthala about 21 km from Jalandhar. In 1930, the mosque was built by a French architect Manteaux, during the reign of Jagatjit Singh, the last Maharaja of Kapurthala. Not much accommodation options are available in Sarnath. 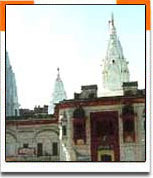 The more convenient way is to stay in Varanasi, which has accommodation options in all the three different categories. Hotel Centrepoint BMC Chowk, Jalandhar Tel. : 458184, 458196. Devotees who travel by air have the nearest airport to Jalandhar at Amritsar, which is well connected to the rest of the cities in the country. One who selects Railways for transport the Jalandhar City Railway Station is the important station on the Delhi-Amritsar Railway line and making Jalandhar easily accessible. Regular trains connect Jalandhar to major cities of the country. By Roadways the city is well facilitated with good roads and a vast network of bus services connecting it to rest of India. To travel around the city one can use rickshaws, taxis or rent a car.